Following a keto diet means you may need to say goodbye to a lot of your old favorites — including sugary coffee drinks like that caramel mocha or pumpkin spice latte from Starbucks. But the end of one era marks the beginning of a new one. And you won’t be missing out on a thing, because when it comes to keto alternatives, there’s plenty to choose from. This salted caramel latte will blow your coffee shop favorites away. With all the flavor and none of the sugar of your typical coffee drinks, you’ll reap the full benefits of your favorite pick-me-up, with none of the downsides. 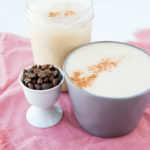 Drink this salted caramel latte hot or over ice for the perfect sweet treat that contains a few health benefits as well. Sugary coffee drinks may give you a buzz for a little while, but then comes the energy crash and brain fog. Not with this sugar-free, keto salted caramel latte. This coffee drink isn’t just delicious, it also may help banish brain fog. MCTs, or medium chain triglycerides, are processed differently than other fats and your body — especially your brain — uses them as an immediate source of energy. Unlike their longer-chain counterparts, medium-chain fatty acids don’t have to take a journey through your lymphatic system before your body can use them as fuel. Since your body rapidly absorbs them and carries them to your liver, MCTs take priority over other types of fuel. That means they also provide your brain with nutrients without the hassle of metabolism and conversion that other fat sources have to go through[*]. Another no-brainer for brain fog? Caffeine. Coffee is known to perk you up when you need a brain boost, and that’s partly due to caffeine’s effect on your neurotransmitters. Caffeine can inhibit the binding of two neurotransmitters — adenosine and benzodiazepine — to their receptors in your brain. These neurotransmitters are known to slow down brain function, which can leave you feeling slow and foggy headed. By blocking their activity, caffeine can help lessen their effect[*]. Trying to get motivated to move when your energy is lagging can feel near impossible. That’s why having tools in your arsenal to push you past fatigue and get you going is an essential part of staying active. Caffeine is the perfect stimulant to get you moving. When you consume caffeine, it enhances the breakdown of fatty acids, while also increasing the release of catecholamines (a type of neurotransmitter). The fatty acids supply your body with more energy, while the catecholamines can enhance your ability to do strenuous work[*]. When researchers did a meta-analysis of several studies looking at the relationship between physical performance and caffeine intake, they found that caffeine acted as a potent performance enhancer — especially for endurance exercise[*]. The MCTs in your latte may also help boost your physical performance. In a study done on mice, researchers found that administration of MCTs enhanced the mice’s ability to swim[*]. Your diet has a direct impact on the health of your brain and may be a strong indicator of your susceptibility to depression. And it’s been shown that diet may have a preventative effect on developing mood disorders like depression in the first place[*]. Aside from keeping your diet clean and staying away from processed carbs, ingredients like the ones found in this salted caramel latte may be the extra boost you need to ward off the doldrums. In a retrospective study of clinical depression, a strong correlation was seen between caffeine intake and the incidence of depression. The study found that depression risk decreases with an increase in caffeine consumption. While the exact mechanism for this correlation is unclear, caffeine is well known to have an impact on your central nervous system[*]. Both depression and anxiety have been linked to oxidative stress[*]. Dietary protocols like calorie restriction and the ketogenic diet, which enhance ketone production, have been linked to decreased oxidative stress in your body. Ketones also have a neuroprotective effect, most likely due to their antioxidant capacity, which has been shown to help restore brain function to normal in those dealing with excess oxidative stress[*]. Consuming MCTs is another way that you can enhance ketone production. By enjoying things like this salted caramel latte, you may increase the number of ketones in your blood, and therefore improve your defenses against oxidation[*]. Enjoy this delicious caramel beverage hot or cold. And if you want to get really fancy, steam your milk in a small saucepan and mix it with your other ingredients. This salted caramel latte will blow Starbucks coffee shop lattes out of the water. Pumpkin spice latte and caramel mocha have new competition with this sugar-free coffee drink. Add all the ingredients, except ice, to a high-speed blender and blend until well-combined. Mix all of the ingredients and stir until mixed. Pour coffee mixture over ice and enjoy! Use ½ cup hot coffee and warm the milk, then add everything to a high-speed blender, blend until well-combined. Serve any of the three topped with keto whipped cream or cinnamon.